One of the hardest things about decorating your home is visualising what the end result will look like. Have you ever purchased several new items for a room only to get them home and discover they really don’t fit or go with what’s already there? I know I have. Tools that enable you to see how accessories can look together are a great idea and I’m all for them. The Look Again Create your Room widget is one such tool and it’s great fun! So much so that my children had a great time playing with it. 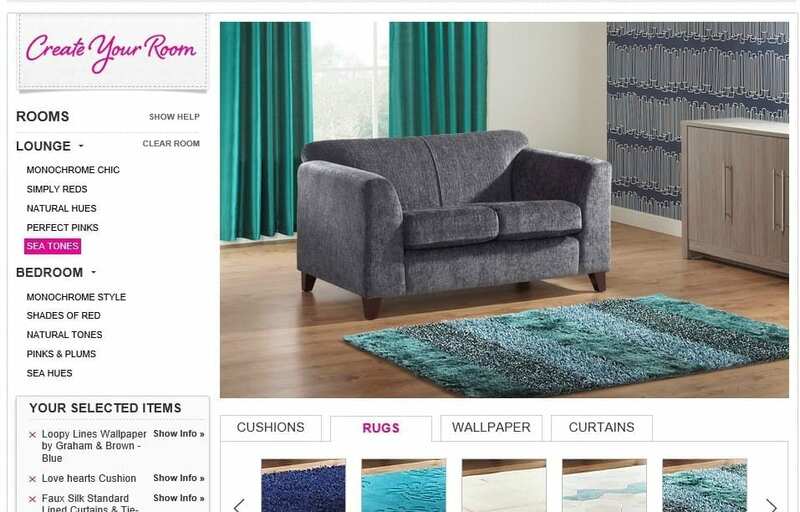 Look Again is an online fashion and home store and the ‘Create Your Room’ widget allows you to see how different products will look when put together in a room. 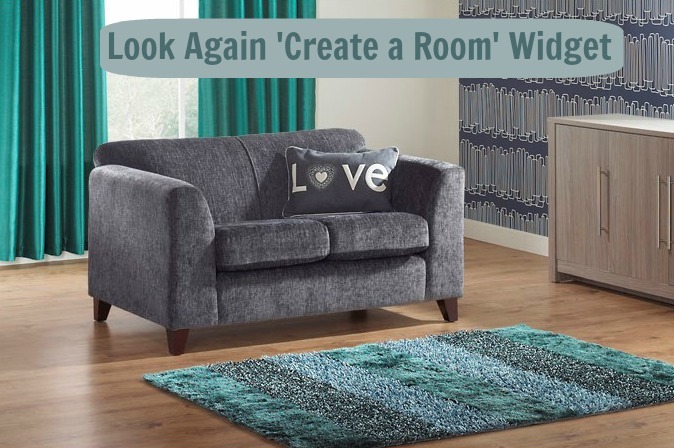 Allowing the decoration of 2 room types, the Bedroom and the Living Room, the widget helps create different looks too. You can choose from Monochrome Chic, Simply Reds, Natural Hues, Perfect Pinks and Sea Hues, or if you’re feeling adventurous you can mix and match. 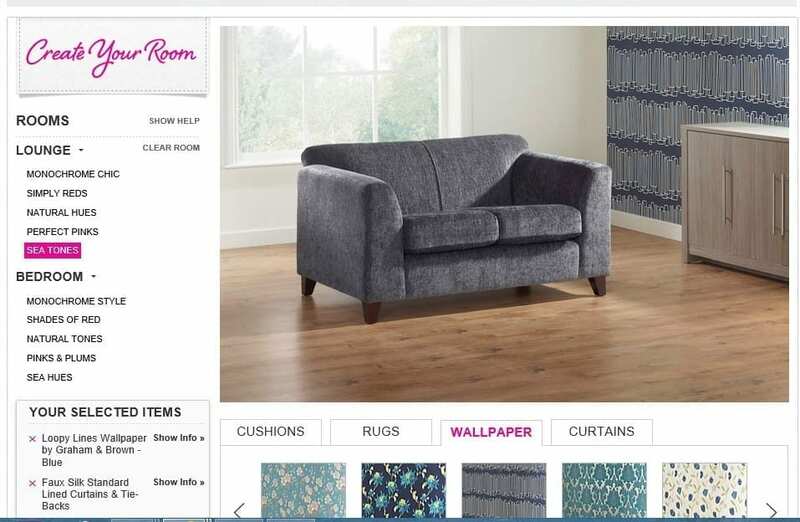 As you’ll see from my example below, once you select your room the designer tool allows you to choose from a selection of Wallpaper, Curtains, Rugs and either Cushions for the Living Room or Duvets for the Bedroom. I’ve decided to go for a Living room of Sea Tones, and I’ve chosen one of my all time favourite wallpapers of the moment – Loopy Lines by Graham and Brown – and I decided to base my room design around this. I’ve gone for a jewelled teal faux silk pair of curtains that lift the darker blue in the wallpaper. For the rug I’ve chosen one with lots of texture and a mix of lighter and darker teal shades to help pull the other two colours together. Here, I must admit I couldn’t find anything within the Sea Tones section that worked with the other items I’d chosen so I skipped across to Monochrome Chic and found this great little ‘Love’ cushion that looked lovely. The widget is great fun and actually a little bit addictive. I spent ages experimenting with different products and looks finding lots of different ways to combine the interiors. However I would love to see a great range in some of the schemes. 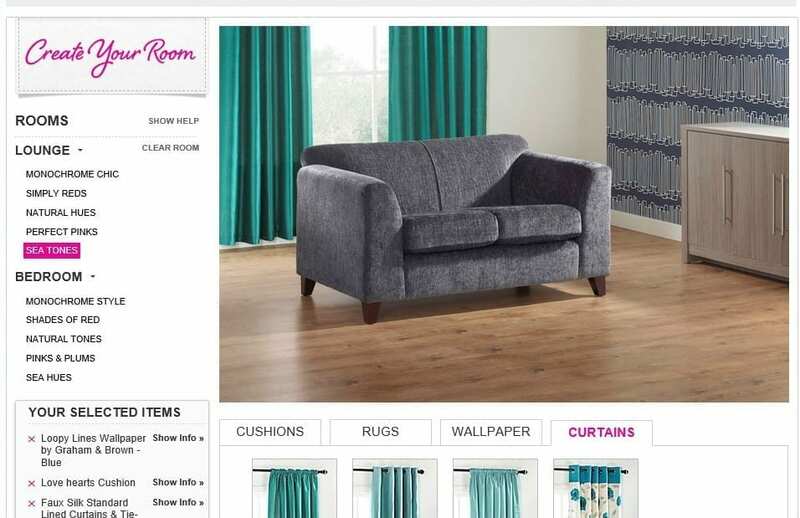 I found a great selection of curtains and wallpaper for example but then found there wasn’t enough choice in cushions to really make it all work together. Hopefully in time the site will add more items and more room types too; wouldn’t that be great! Designing a bathroom or kitchen look would be very popular I’m sure, as well as kids rooms too. I do like that fact that virtually, you can try before you buy. 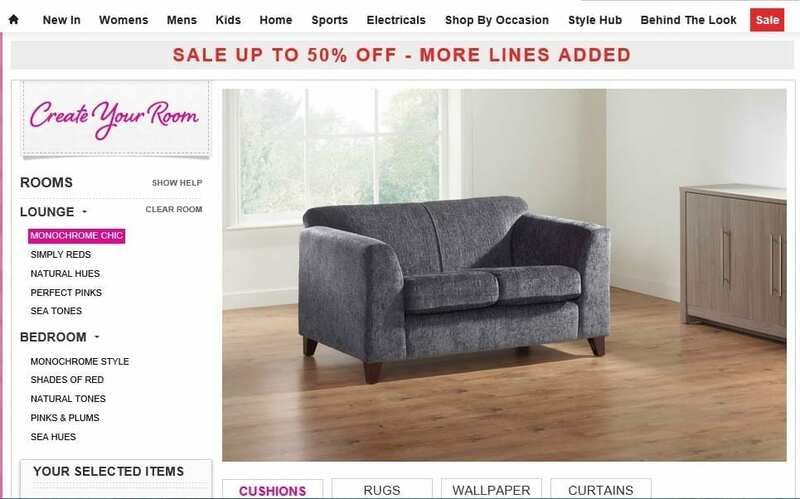 Once you’ve chosen the products in your dream room it’s very easy to select them in the right sizes for your home and add them to your basket. This is a great addition to the Look Again site and as you can tell I really enjoyed playing around with it. 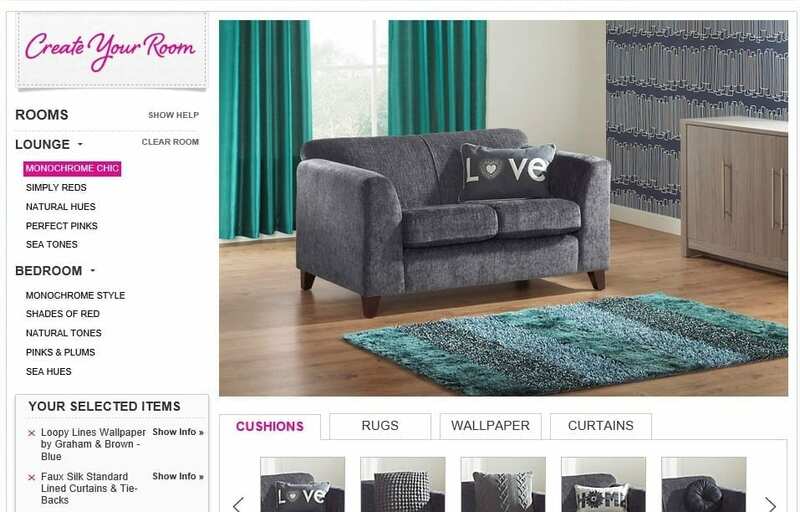 Next time you’re online and shopping for new home interiors why not give it a go!